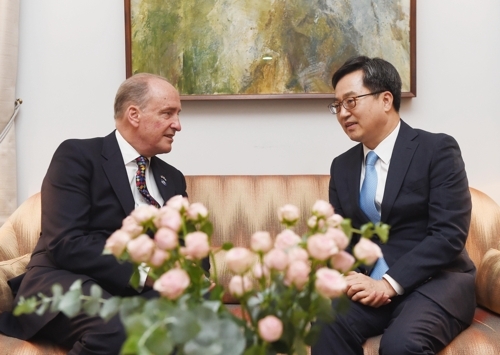 (SEJONG=Yonhap News) South Korea and Britain agreed on Friday to strengthen cooperation in their talks to forge a bilateral trade deal and make concerted efforts to fight growing trade protectionism, Seoul's finance ministry said. During a meeting with the City of London's Lord Mayor Charles Bowman, Finance Minister Kim Dong-yeon also urged cooperation from Britain for the fintech industry, according to the ministry. South Korea and Britain have been in working-level talks for a new trade deal after London exits the European Union. Seoul signed a free trade agreement with the EU in 2011, but it will have to strike a fresh arrangement with Britain once it formally leaves the 28-nation bloc in 2019. Britain is South Korea's second-largest trading partner in Europe, with bilateral trade volume having increased from $8.79 billion in 2011 to $13.52 billion in 2015, according to government data. South Korea's auto industry has benefited most from the implementation of the FTA with the EU, while Britain's exports of crude oil, vehicles and cosmetics have greatly increased over the past six years.